Julia Neal received a BA in Creative Writing from the University of Washington before moving on to get her veterinary degree from Washington State University. Dr. Neal has a strong love of working with animals and people which started early with a job at Woodland Park Zoo. 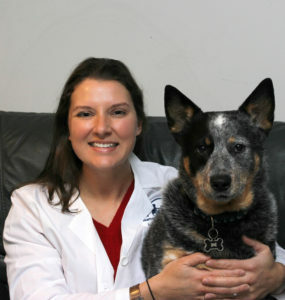 She was also a veterinary assistant at Northwest Veterinary Hospital when she was younger which helped her cement her desire to become a veterinarian. Since then she’s pursued training to hone her surgical and diagnostic skills. She has a special interest in behavioral medicine as well as a physical rehabilitation for pets. When she’s not at work, Dr. Neal enjoys reading, hiking, and traveling. She lives with a spoiled dog named Charlie and three cats who run the house named Starsky, Sundance, and Pinot.